Different storage conditions are required to store different pharmaceutical materials according to the nature of the product. Different storage conditions are required in pharmaceuticals. In the storage area, drug substances are stored on different storage conditions according to their requirements. Some chemicals and solutions in quality control and media in microbiology section are required to store in specific storage conditions. 1. 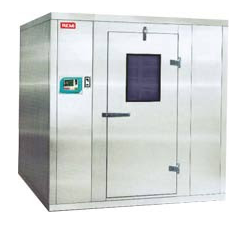 Room Temperature: Most of the pharmaceutical activities are done at room temperature. 20 to 25°C temperature is considered room temperature in pharmaceuticals. All controlled samples are also stored at this temperature. Excipients and APIs in the warehouse are stored at this temperature. 2. Cool Storage Conditions: 8 to 15°C temperature is known as cool storage conditions. Some drug substances in the warehouse, those degrade at room temperature are stored at this temperature. 3. Cold Storage Conditions: Cold conditions are from 2 to 8°C temperature. This temperature decreases the rate of chemical reactions as well as the microbial growth. The highly degradable drugs, vitamins and chemicals are stored in cold conditions. Reference standards, HPLC and GC standards, limit test standards, vitamin standard solutions in quality control are stored at cold temperature conditions. In microbiology laboratory, reference cultures are stored in cold storage conditions. It helps to maintain them for a long period by slowing down their vegetative growth. Culture suspension prepared in normal saline retains living microorganisms for one week if stored in cold temperature storage conditions. Some culture media are also required to store at this temperature. 4. Fridge Storage Conditions: -4 to 2°C temperature storage conditions are known as the fridge. What is the criteria to choose hplc and gc columns for new drugs? In comparative dissolution study done as per WHO/USP - if a tablet formulation shows more than 85 % in two media out of 3 recommended dissolution media. in such case is it mandatory to calculate F2 valve (similarity factor) for all three media or F2 value calculation is sufficient for single media in witch % dissolution results are less than 85: in 15 min.